JRINK, a juicery at 19th and I streets, sells a range of raw juices that are packed with fresh produce. 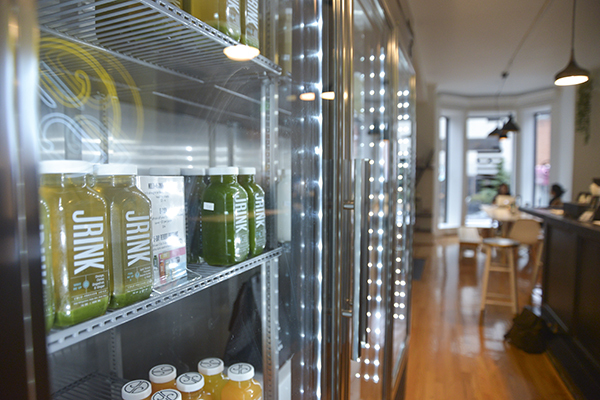 JRINK, which opened its Foggy Bottom location last month, sells bottles of cold-pressed juices for about $9 each. Drinks range from green juices, with blended vegetables and fruits, to nut milks sweetened with cinnamon and vanilla. We took a trip to see if it is worth the price. As someone who has never eaten kale before, I wouldn’t normally seek out an eatery located within a yoga studio. But after a Thanksgiving break that involved consuming way too many mashed potatoes and a visit to the doctor who chided me for not eating enough vegetables, I made my way to JRINK juicery on 19th and I streets. The juice bar I stepped into was not the stainless steel-clad hub for Soul Cycle regulars that I expected. The fresh, white decor was inviting and the nook offered a cafe vibe: At a communal table by the window, two girls chatted while working on their laptops. The rectangular glass bottles the juices come in were a plus (I’m holding onto mine as a souvenir that will double as a flower vase.) But when I opened the first bottle of Fuel Me Up – with pear, kale, cucumber, romaine and lettuce – to take a whiff before I drank it, I was worried that I was about to choke down a bottle of liquified salad. But the drink was surprisingly refreshing and even sweet. The cucumber made it mild instead of bitter, and if it weren’t for the bright green color, I would have thought it was just a regular fruit juice. The vegetables came through a bit more in the Fuel Me Up 2 – with spinach, cucumber and broccoli – but the apple juice and kick of ginger helped balance it out. Though I was tempted to try a flavor called “Sweeten Me Up” – with pineapple, apple and mint – I knew I had come to JRINK to try and incorporate things into my diet that I wouldn’t normally eat. Instead, I opted for “Pick Me Up,” a beet juice infused with carrot, apple and ginger, and a festive pumpkin chai nut milk, made from tiger nuts and pea protein and flavored with dates and vanilla. However, the pumpkin chai was not the comforting fall-themed beverage I had wanted. For a drink loaded with ingredients like tiger nuts, pea protein, a South American peanut called sacha inchi and lucuma, a fruit also known as “eggfruit,” I don’t know what I expected. The grainy texture became smoother after a few sips, but it left a sour aftertaste with not enough flavor to sweeten the pumpkin. Next time, I’ll just go for the real thing at Starbucks. Still, JRINK gave me what I was looking for: a way to turn things that I wouldn’t normally eat into things I could actually consume. As far as prices go, a green juice could replace a salad from Sweetgreen – and it would taste much better. The only dieting mantra I’ve ever lived by is “don’t drink your calories.” And while this saying is mainly meant to dissuade you from sugary drinks like soda or high-fat lattes from Starbucks, I follow the same philosophy when it comes to healthy juice drinks. If I want to eat healthy, I will gladly have an apple or a salad, but it would never occur to me to spend $9.50 on a 16-ounce bottle of juice to fill me up instead. Naturally, JRINK had a lot to prove. The first menu item I noticed at JRINK was its “Clean Me Up” juice, featuring the lemon and cayenne pepper mixture Beyoncé has made famous in her month-long juice cleanses. I knew sampling this drink once would not produce Beyoncé-level results but I decided to try it anyway. At first sip, I was surprised by how mild it was. It took several sips for me to detect any cayenne and even then I only noticed it leaving a slight tingling on my tongue as an aftertaste. It reminded me of Newman’s Own lemonade brand, the type of slightly sour lemonade that I would hate as a kid for not being sugary enough, but now I find mildly pleasant. As a month-long form of sustenance, however? I’ll leave that to Bey. The next drink I tried was the “Build Me Up,” featuring raw almonds, vanilla bean, cinnamon and dates. I chose this drink mainly on the basis of having the most sweet-sounding ingredients. I was also curious to see how filling it would be given that the salesperson in the store recommended it as a meal replacement drink with enough calories and nutrients to serve as lunch or dinner. The drink ended up tasting like creamy, not-too-thick almond milk, with not overly strong hints of vanilla and cinnamon. However, toward the end of the drink, some of the congealed cinnamon and date paste at the bottom created a gross, slimy texture that felt like snot going down my throat. Also, per the JRINK website, the rough calorie estimate for nut-based juices is about 350 calories. That’s only 100 calories fewer than a salad from Sweetgreen and way less filling. I tried the “’Tis The Season” drink next as it is officially December. Another drink in the meal replacement category, this one contains apple, pear, sweet potato and cinnamon. It tasted exactly like your average apple juice that comes in a juicebox, and is just as sweet. Smelling it I got hints of sweet potato, but I could taste none on my tongue. And perhaps I should have given the drink a better shake first because the cinnamon collected on the bottom never made it to my palette either. The final drink I tried, the “Clean Me Up II” – featuring apple, lemon, ginger and turmeric – smelled a lot spicier than the other drinks, with strong notes of ginger wafting out of the bottle. It was also the worst of the bunch. At first I got the rush of sweetness from the apple, but after a moment the turmeric hit and took away all of the pleasantness. While not particularly spicy, it left a pungent and bitter aftertaste. If the idea of dumping a spice rack into a perfectly nice glass of apple juice sounds appealing, then this is the drink for you. Otherwise, avoid. In fact, I would avoid JRINK in general. Even though some of the drinks turned out to be surprisingly sweet and mild, the prices cannot be justified. I spent $37.50 on four bottles of juice, one of which I could not finish. They did not leave me full yet I still probably consumed around 500 calories between sips of all four of them.